I’ve reached that point in January where my body just craves healthy food. I think it’s down to the need to feel well and boost vital nutrients in the body. I realise that I normally blog on a sweet-savoury rotation but I’ve not been baking much recently. I’ll try my best to squeeze something sweet in soon I promise! 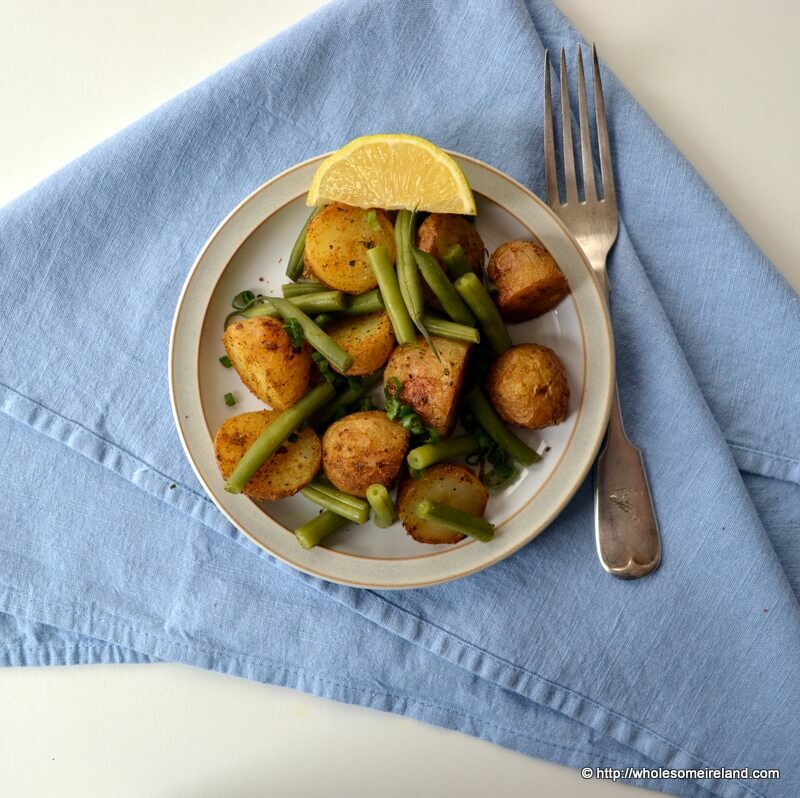 In the meantime I had some steamed baby potatoes leftover from a shoot yesterday and I hate throwing food out. When you cook waxy baby potatoes twice they take on an almost sweet flavour. Honestly I could have eaten a massive bowl of this warm salad but I didn’t make loads, just enough to fill myself for lunch. If you’re not vegetarian/vegan then a poached egg on top would be an inspired addition to the plate. The quantities are easily increased according to the number of people you’re preparing lunch for. Preheat a (fan) oven to 180 degrees Celsius and line a small baking tray. Put the potatoes and the sunflower oil in a large bowl and ensure that the potatoes have a thin coating of oil. Sprinkle the dried spices on top and stir well to make sure that they get a dry crust coating. Pour the potatoes onto a baking tray and put in the oven for 20 minutes. Remember they are already cooked, so all you’re trying to do is to cook off the crust and warm them through. Rinse off your bowl and fill it with hot boiling water. Plunge the green beans into the water for 5 minutes before removing and rinsing with cold water then slicing into chunks. 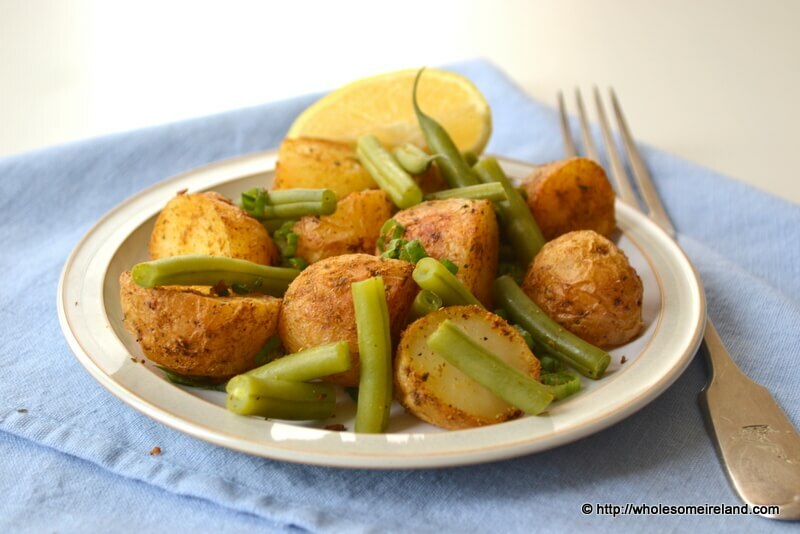 Once the potatoes have a crisp spice coating, remove them from the oven and allow to cool a little before mixing with the green beans and scallions. Use a squeeze of fresh lemon juice to dress the warm salad. I made this yesterday, but stewed the potato and beans with the spices instead of baking. I had a big potato left over from a stew, so it was a little too ‘soupy’ to bake, but it soaked the spices right up and was delicious. Great flavor! Great to hear. Thanks Felice!